CENTRAL FALLS, RI--(Marketwired - Jun 17, 2015) - Acopia Harvest, a sustainable technology company specializing in hydroponics, was paid a visit by Lt. Gov. Daniel J. McKee on Wednesday to tour their Rentafarm™ commercial growing facility and learn about increased, sustainable urban food production. According to Amy Chauvin, Acopia Harvest Director of Operations, "This new system allows restaurants, food service companies and everyday families to grow their own healthy and nutritious herbs and vegetables without toxic chemicals or pesticides -- 52 weeks a year." The Rentafarm model is designed to be applied in a 50,000 square foot property in Central Falls and will provide customized farming spaces with the option to have freshly harvested produce delivered to end-users. Rentafarm's unique service maintains each individual farm 10 to 14 hours daily, handling all the tasks necessary to provide top quality produce, even if a "Rentafarmer" is on vacation. The service takes the work out of producing herbs and vegetables. Lt. Gov. McKee's visit came just a few weeks after Acopia Harvest Director, Amy Chauvin, partook in a special round-table event on May 15th that focused on open discussion among small business owners and municipal leaders on boosting business friendliness in Rhode Island. Lt. Gov. McKee's "Advance RI" roundtable also convened top members of Gov. Raimondo's economic development team. Ms. Chauvin adds, "We enjoyed having the Lt. Governor tour our operation. With his support, we hope to foster a lasting relationship with Rhode Island's leadership." The Acopia Harvest mission is to increase awareness of its urban hydroponic program model, which aims to reduce carbon emissions to the environment by 94% via local and sustainable food production practices. The company is funded by Mr. Irving A. Backman of Dedham, MA, an entrepreneur and developer of alternative renewable projects and technologies relating to sustainability and environmental innovation for more than 40 years. 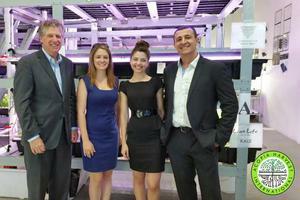 Left to Right: Rhode Island Lieutenant Governor Daniel McKee, Amy Chauvin, Monica Ryl, Ameth Alzate at Acopia Harvest Central Falls, RI hydroponic food production facility.